After a great Hawaiian tour (see below for the story), we've traveled up the west coast and arrived in Portland this week. It's much the way we left it - still cold and raining - but always a warm welcome back. 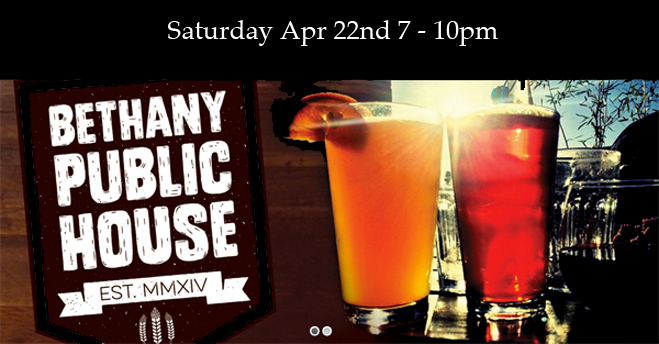 I'm playing two shows while I'm in town; Friday, April 21st (8-11pm) in our old favorite Mahers Irish Pub in Lake Oswego and one the following day, Saturday April 22nd (7-10pm) in the Bethany pub, Portland. 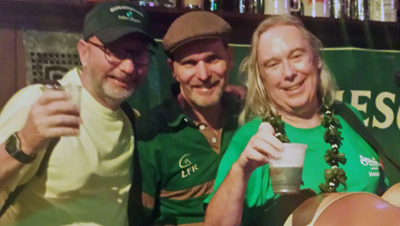 Last month was St Patrick's season in Honolulu, Hawaii - it's a tough gig, but I managed to survive. Just. Hahaha! Well, first, the place is just beautiful, palm trees, banana trees, sourdough trees, nut trees, nut cases, lovely beaches, beautiful. Wow, people are active - surfing, kite surfing, canoeing, swimming, snorkelling, diving... Man!! I was exhausted just lying there watching them all. A warm, sunny paradise which made you feel happy whatever you were doing. We were met at the airport by our hosts, David, Linda and their other guest Bill Rudder (when you live in Hawaii, you can expect visitors!). Linda lei'd us immediately - way-hay!! They smelled lovely (and so did the flowers!). My lei lasted the whole trip ... it was smelling less sweet by the end, but I quite liked it's stale Guinness and spilled whisky aroma! 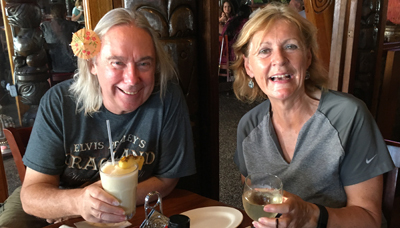 I don't know how David & Linda (or the Hawaiian Celtic folks) do it - they were busy each day, at every event, visiting schools and places interested in knowing more about Celtic Culture, the Irish and St Patrick in general. 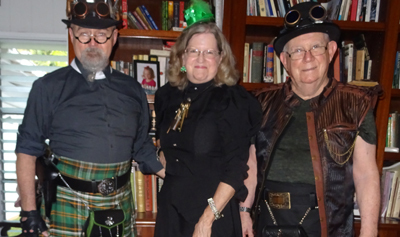 Bill Rudder, an ex-colleague and good family friend was up for anything too and attended just about every thing David and Linda did - the picture here shows them heading off to a Steam Punk gathering in Downtown, Honolulu. 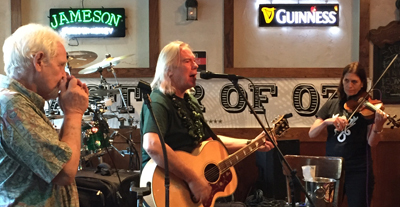 During the week leading up to St Patrick's day (which was a Friday this year) I played in three of Bill Comerford's Irish pubs, Anna O'Briens, Kelley O'Neils and O'Tooles. The Hawaii Celtic crew were well in evidence at each show - I admire their stamina and energy. Every time I would look at them, they were up to some mischief or other. When I played "Big Tam" and got to the kazoo solo (yes kazoo solo... if you haven't got my CD - you really need to... how many CDs can you buy that have a kazoo solo ??? ) to find I was being accompanied by everyone in the pub - some folks were even blowing through the right end! What a laugh. They know how to party. The Friday came - hooray! - St Patrick's day, when everyone becomes Irish. There were green people everywhere all day. 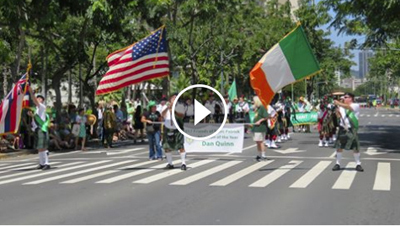 The St Patrick's parade was headed up by a flag carrying Bill Comerford, the friends of St Patrick society were all there - as were the St Andrews Society of Hawaii - Scots cunningly disguised as Irish and the crowds lined the streets of Waikiki for the spectacle. There were pipers, brass bands, military, Irish dancers, classic cars carrying celebrities and beauty queens, a very shiny red truck, Irish dancers (worth two mentions! ), St Patrick's school (I wonder if they teach Guinness lessons?). A St Patrick's day parade goes at a good pace - as everyone headed straight to the pub afterwards! I played in O'Tooles for four hours. they had removed all the tables and chairs... and anything not nailed down to maximise standing room. The street outside was lined with beer kegs with helpful young folks squirting beer into glasses for you. The car park was turned into a big milling / falling about area with plenty food and drink for all. There was a big stage for the big bands playing later into the night and starting from three o'clock, the pubs and street and car park just got busier and busier as thousands of "Irish for a day" people flooded downtown Honolulu to the "Block Party". At 9pm I was exhausted, a wee bit tipsy and struggling to walk out of the downtown area as hundreds more people were flowing in to join the thousands already there... wow! At my last show I was joined on-stage by Lisa Hancock Gomes playing her fiddle and Patrick McGivern on harmonica. It was great playing with them and especially Lisa as she guested on that CD I was telling you about earlier that you really should buy! This time in Honolulu we actually took a week at the end of playing (and craziness) to ourselves to relax and enjoy the place (not that we didn't enjoy it last time - but you know what I mean). We loved eating out in Kailua where, in some places, you take your own booze into the restaurant, they serve you food, give you glasses and open your bottle if you want all at no cost - no "corkage" charge and you can drink nice wine at wine store prices - lovely (said the mean old Scotsman!). Last year I ran a whisky tasting in Honolulu and this year I attended Bill C's Irish one. 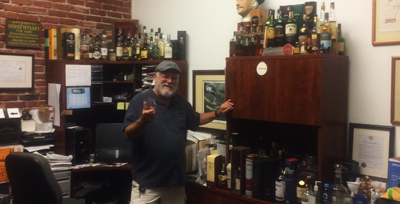 We had eight whiskies, food and good company... then it was upstairs to Bill's office with wall-to-wall whisky. At 4am when I got to sleep on Bill's couch I couldn't "taste" another drop. At 9am it was breakfast then golf... his tactic to spoil my game was unnecessary - it was a lovely course though! 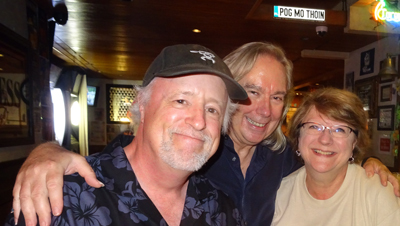 It's a small world - when Pat Kufel Ebben (my Polka dance partner from Kyle & Lauren's wedding in Wisconsin) saw my travel schedule and we would be in Honolulu - she said - oh, we're there - we'll be there! 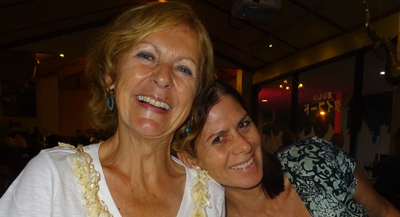 Right enough, they were at Kelley O'Neils - and enjoying a nice time with their son who works in Waikiki. In our last week there as tourists, better than tourists actually as we had been there before so we weren't in a wild rush to see everything, we just took our time and enjoyed everything. Lisa (fiddle, remember) spent a day taking us around to her favorite places, seeing where she goes fishing (by wading in) at Kaneohe bay (we skipped her recommendation of Shark bay on the North coast - famous for it's hammerhead sharks). She took us to the Byodo-in Japanese Buddhist temple in the valley of the temples. It was just like being in Japan, we even got to feed the fish (and the birds who thought giving that nice stuff to the fish was an awful waste). If you like chocolate - this is heaven - we visited the Manoa chocolate factory in Kailua (while we were waiting for a seat for brunch) and were treated to a tour of the process they use and (of course) sampled the chocolate... if you have a few bob to spare - that is excellent chocolate. I recommend it with a nice peaty Lagavulin 16 year old whisky !! After Honolulu, we had a short visit to San Diego ... the high point has to be the three and a half hours I spent sailing (yes me, sailing, splice the mainbrace ye lubbers, extra tot of rum for the crew Bosun... all that) our friend David's 35 foot sail boat around San Diego Bay - wow, that was incredible! Well, we're back in Portland, Oregon in the same RV park, in exactly the same the spot that we left in October 2016 with exactly the same cold, rainy weather and mud outside our door as last year. Which sort of makes us feel that we have made the right move to change our base to Florida. We are in the process of buying a house there and will move our stuff from our place in Washington next week, drive to Florida and sign for the house on May 1st. We will live there (six miles from Dundee... no joke!) over the winter. 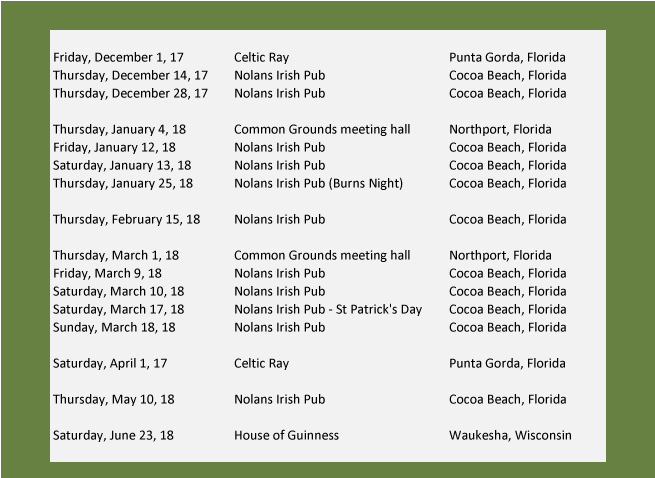 I have a lot of places I will play in Florida and we'll dust off the 5th wheel and continue to travel and play during the summer - visiting the Pacific North West when it's not cold or raining! We'll be in Europe June to mid-August for various family / living related things and will no doubt play a few times while I am there. I get back to Portland too late for the Highland Games - which is a shame, but I will be playing in my usual haunts and a few private shows then finish off the season end October at the fantastic Galway Bay Celtic festival in Washington. Keep well and keep enjoying your music. O'Tooles - around 5pm on St Patrick's day - folks still doing ok !! !